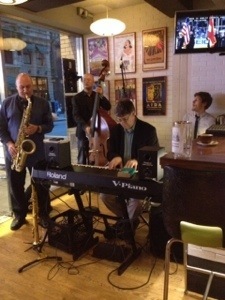 Every Monday and Tuesday night at E&E, we present live jazz in the bar area along with great food and drinks. What began as an experiment has become a regular gig for the talented musicians Craig McGorry (tenor and soprano saxophonist) and his Quartet, and jazz drummer Matt Matysik and his Quartet. And we could not be happier! Who are these talented musicians? Craig McGorry is a tenor and soprano saxophonist who has been playing and teaching in New York City for over 20 years. A passionate educator, McGorry has a distinguished academic and teaching resume and currently teaches at the New York Jazz Workshop and at the East Coast Music festival. Matt Matysik is a jazz drummer who hails from Madison, Wisconsin and has been living in New York City since 2008. He continues to study and performs regularly at art gallery RIVAA on Roosevelt Island. When not playing jazz drums, Matt works for The Volatility Institute at New York University. So – come for the jazz, stay for dinner. Start off the week right by calling now to reserve.